Gov. Greg Abbott will force lawmakers back to the Capitol on July 18 to complete business left undone in the 140-day legislative session that ended Memorial Day. 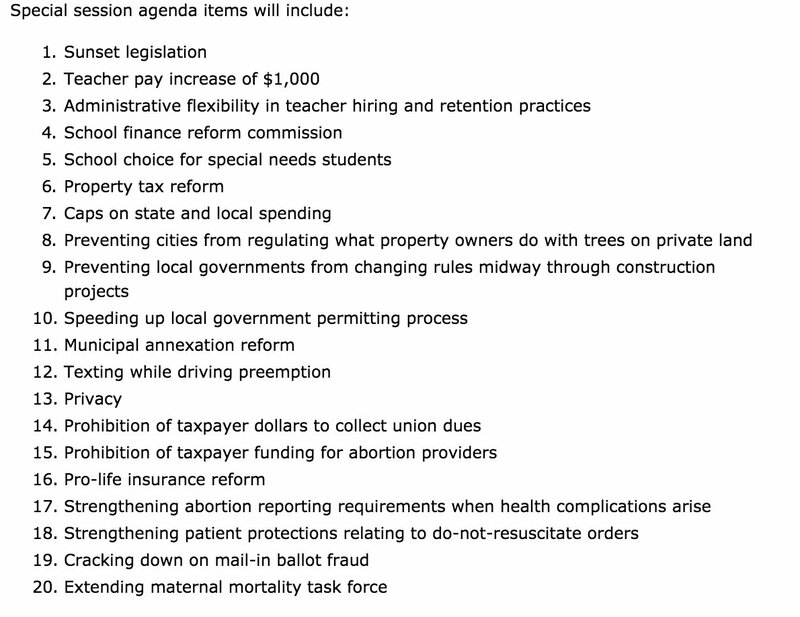 "The Texas Republican Party executive committee on Tuesday sent Abbott a letter with an even bigger proposed agenda. In addition to the bathroom and tax measures, the nearly 60 GOP authors said they want lawmakers to vote on bills that would allow Texans to carry guns without licenses; abolish abortion and refuse to follow federal rules and court orders that allow the procedure; and allow parents to use taxpayer money to send their children to private schools." I am actually surprised to see this on here. I didn't think think this would get any attention if there was a special session. Kolamer wrote: "The Texas Republican Party executive committee on Tuesday sent Abbott a letter with an even bigger proposed agenda. In addition to the bathroom and tax measures, the nearly 60 GOP authors said they want lawmakers to vote on bills that would allow Texans to carry guns without licenses; abolish abortion and refuse to follow federal rules and court orders that allow the procedure; and allow parents to use taxpayer money to send their children to private schools." Would be nice if HB 560 got put on the agenda. Last edited by NotRPB on Tue Jun 06, 2017 4:51 pm, edited 2 times in total. So does this out charles back in limited explanation mode? Weren't they also supposed to talk about girls and boys toilets and the proper use thereof? Jonathan Strickland tweeted that he will be filing constitutional carry on first day of special session. allow parents to use taxpayer money to send their children to private schools. I want to use public transportation money to buy myself a private car. Someone needs to file HB 560 and push it. If they are going to discuss bathrooms they need to discuss HB560!